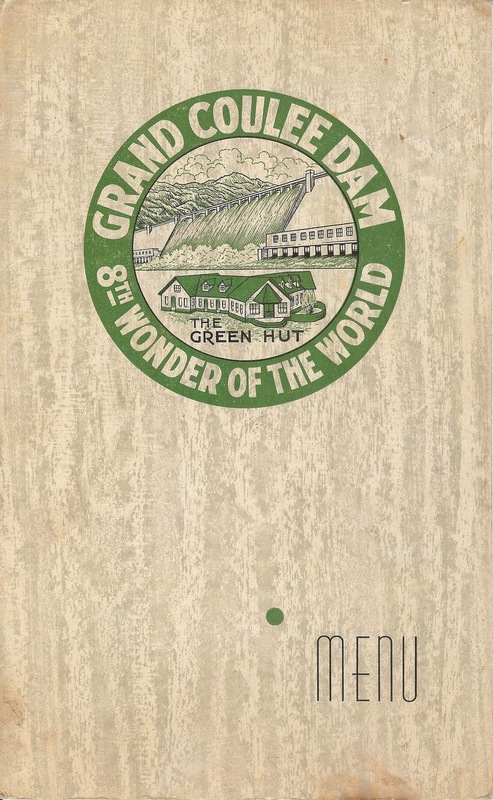 The Green Hut was a landmark cafe, souvenir stand, and vista point at the base of Grand Coulee Dam. 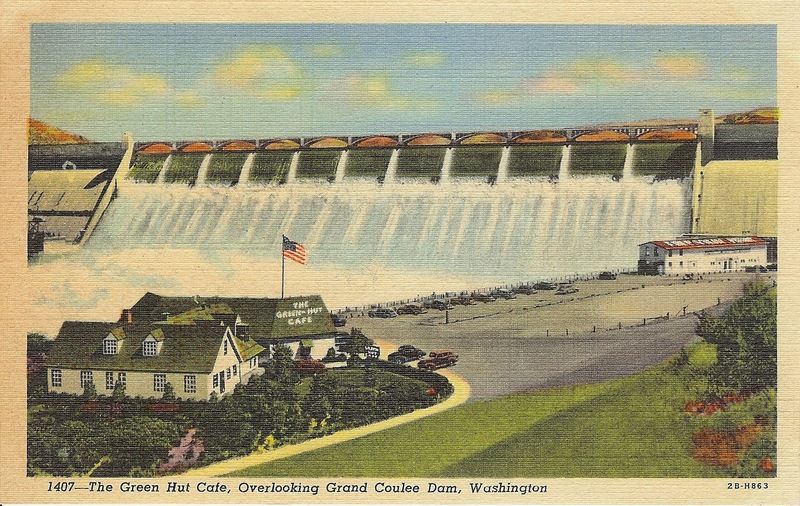 The cafe was opened in 1938 by Clarence D. Newland, who had previously operated Green Huts at two earlier federal dam projects, at Fort Peck on the Missouri, and at Boulder on the Colorado. The prime location below the Grand Coulee spillway made the Green Hut a tourist destination from the beginning of construction until it burned on September 11, 1964. The cafe included a souvenir shop, and Grand Coulee souvenirs — postcard views especially — often feature the Green Hut. After the cafe’s demise, the Grand Coulee interpretive center was built on the former site of the Green Hut. 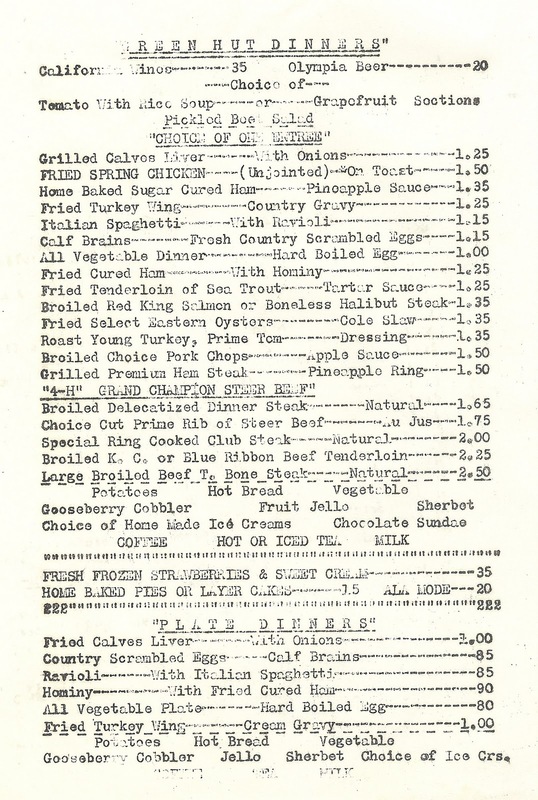 This menu, which dates from about 1950, includes two carbon paper sheets of daily special items, one of which is shown here. Beef makes a strong showing, and the cafe had apparently recently purchased one of the county fair’s 4-H grand champion steers; this was once a common gesture by restaurants in agricultural areas. The menu’s wide-ranging variety of dishes suggests the wide-ranging employment draw of the Grand Coulee project: there’s ham and hominy, ham and pineapple, calf brains and liver, salmon and spaghetti, and gooseberry cobbler. The sandwich menu (not shown) includes not only hamburgers and tuna fish sandwiches, but also salami, bologna, Denver, and St. Paul sandwiches. A Denver sandwich is related to a Denver omelette: onion, green pepper, ham, and scrambled egg between bread slices. But a St. Paul? Wikipedia expounds on an egg foo yung sandwich that is popular in St. Louis (yes, St. Louis), and also rather vaguely asserts that the term “has meant multiple things over the past sixty years”; “Originally, the St. Paul sandwich was known to contain four pieces of white bread with chicken and egg stuffed inside.” I shall have to peruse some old cookbooks, I can see. I’m still looking for some kind of biography of Clarence D. Newland.